Thermage® is the only non-invasive treatment that deeply tightens and contours the skin, with virtually no downtime. In as little as one treatment with Thermage®, your skin may immediately feel tighter, smoother, and appear more youthful. Even better, you will likely notice additional tightening over time, as Thermage® continues to improve your skin for 3 to 6 months after treatment. The FDA-approved Thermage® procedure employs a patented radiofrequency (RF) technology called Thermacool™, which has been clinically proven to tighten and gently lift skin to smooth out wrinkles and renew facial contours. 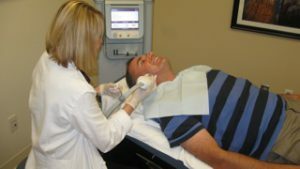 The incision-free procedure is fast and easy, requires no downtime, and can be performed on patients of all skin types. The Thermacool™ device is used for the non-invasive treatment of facial wrinkles and body contouring. 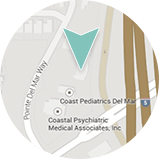 Always on the cutting edge of aesthetic technology, Del Mar dermatologist Deborah H. Atkin, M.D. offers the newest of Thermage® treatments, Comfort Pulse Technology® (CPT). This advanced treatment method employs vibration to decrease any discomfort, leading to a more comfortable and effective treatment. Did You Know?Dr. Atkin was involved in research and the development of treatment parameters for Thermage®? Over 500,000 Thermage® treatments have been performed in the United States. Thermage® stimulates the collagen so that it will keep working to improve skin texture after treatment. Plus, unlike other skin tightening procedures, Thermage® works after one treatment, although benefits are additive with multiple treatments. Many patients incorporate Thermage® treatments into their annual skin care regime to continue to promote collagen renewal and what Dr. Atkin refers to as an anti-aging phenomenon. The collagen levels in your skin are decreasing every day. As we age, the reduction in collagen results in the wrinkling and sagging of the skin. Thermage® stimulates your body’s natural renewal of collagen which softens wrinkles and tightens the skin. If you could turn back the hands of time by ten years and restore your skin’s appearance, would you? Then why not stop the clock today? Dr. Atkin will work with you to develop a skin care regimen that prevents further skin damage and creates your own anti-aging phenomenon. Tightening and lifting of the skin for a smoother, more healthy-looking texture and improved skin tone. There may be mild redness in the treatment area that goes away within a few minutes. After treatment you can return to your normal activities without anyone knowing you’ve had “a procedure”. Length of Time for Procedure – Depending on the size and number of areas being treated, Thermage® can be performed in as little as 20 minutes. Multiple areas will require additional time. Who Will Perform This Procedure? – Dr. Atkin, our board-certified dermatologist, will perform this procedure. What is the Recovery Time? There is no downtime with this procedure. Final Results of the Procedure – Tighter, firmer skin. You will begin to see a result in about 3 weeks, with the final result at 3 -6 months as new collagen forms. Other Treatments or Skincare Products that May Improve My Result? Many patients that have Thermage® also benefit from Fraxel® Dual skin resurfacing to improve skin discoloration, irregular texture and pre-cancerous changes. Patients having Thermage® will also see enhanced benefits if they use SkinMedica® TNS Essential Serum, Retinol Complex and Dermal Repair as their anti-aging skin care regimen.